Don’t take my word for it. Take a look at these pictures, and even the pictures don’t do this fish justice. The adult, male Melanurus wrasse it typically wrasse shaped (torpedo shaped?) and has an amazing blend of turquoise blue and green colors on the main part of its body along with red, horizontal maze-like stripes from head to tail. Note the bright coloration of this male melanurus wrasse. This picture even understates its beauty. 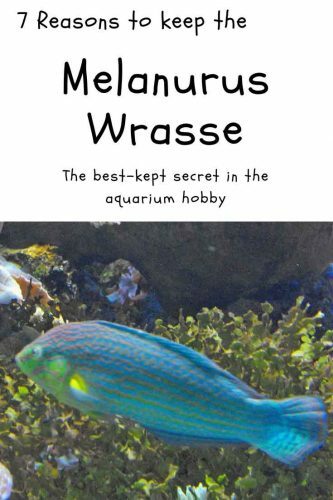 Unlike some of the larger angelfish species which start out as brightly colored juveniles and turn into drab colored adults, Hoeven’s wrasse grows into its color. Adult males are generally thought to be more beautiful so it might be worth purchasing a fish with known gender if you want to get the best-looking fish for the money. This is generally available as a wild-caught fish, but it has a good survival record and generally does well in captivity. 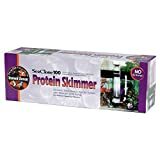 One of the reasons it does so well in an established reef aquarium is that it has a voracious appetite and learns to eat commercial foods. This fish is a fast-growing eating machine. Juveniles are often purchased in the 1.5 – 2-inch range, but they quickly grow to their full 5-inch adult size in about 3 years. This fish is packed with personality. During the daytime hours, you will see it zipping in and out of all the rock work, hungrily looking for something to eat. Then, when the Melanurus wrasse is ready for bed (or if it gets sufficiently scared), it burrows into the sand. Oh, by the way, since it buries in the sand, make sure to pick a fine grain sandy substrate. Not only is Hailichoeres melanurus all of these other amazing things, but it is also an extremely helpful fish to add to your tank because it will eat parasitic pyramid snails, flatworms, and nudibranchs. Now that is a good deal. Hoeven’s wrasse is reported to be mostly reef safe. Now, I know that is a bit of a troubling description, because fish are either reef safe, or they are not. 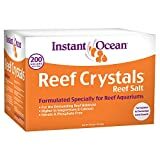 I couldn’t find any hard facts about why they are not considered to be fully reef safe. There are many accounts from hobbyists saying they were great additions to their tanks and were reef safe. There was one account of an individual having a habit of flipping over snails and nipping at them (but not killing them), and I read one report that speculated that the ‘mostly’ reef safe designation was because the 6-inch adults have large mouths and could, therefore, eat your shrimp. Like most other wrasse species, these fish like to surf on carpets, when the lights are out, so keep a tight lid on your tank or make sure you have mesh over your open tank so that he or she can’t jump out and dry out on your carpet. I’ve lost a few fish that way, over the years. It is a real bummer. Since they are aggressive eaters, too, it’s best to limit yourself to 1 per tank, because it will use the entire tank as its feeding ground and pick you clean out of tiny, mobile invertebrates, like copepods, amphipods, etc.. It is generally not recommended to keep this fish in anything less than ~40-50 gallon tanks. 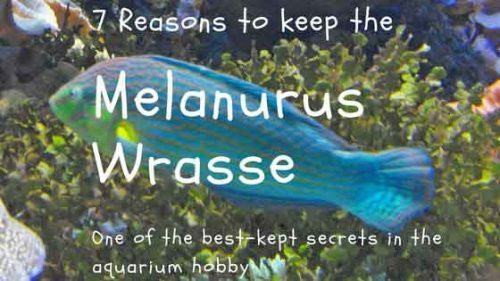 I’ve been in this hobby for a long time now, but I was slow to notice the Melanurus wrasse. I was well aware of the stunning beauty of some of the other wrasses: fairy wrasses, flasher wrasses (Carpenter, McCosker’s), you name it. I was also aware of the somewhat similarly colored and notoriously troublesome 6-line wrasse. But somehow Hoeven must have been keeping this one a secret. Well, I hope you get as much enjoyment out of checking out this fish as I do. Leave a comment and share whether you’re interested in this fish or if you’ve already had success keeping it. I am looking for a wrasse for my newly set up 90 gallon. I will keep this one in mind! Thanks for another great article Al! I had a Christmas wrasse that look quit similar. Get fish. Fun to watch and beautiful! I will get another in not one of these for my 140gl reef. Thanks for the comments, Brandon and Muttley000! I got one of these because I had a flat worm problem. I had tried everything I could think of to get rid of them and nothing or any other fish I tried worked (yellow wrasse, mandarin). I put the Melanurus in there and he ignored the flat worms. One day I happened to look into a corner of my tank where the flatworms would congregate and laugh at my attempts to eradicate them and they were gone! So every day I would look at the flatworm population in my tank and it was declining. Then I started watching the wrasse closely and he would periodically snack on the worms. I cannot spot any in the display tank now. I really enjoy this fish because he is extremely active, gets along with tankmates and eats flatworms. Great addition to my 125 gallon tank. Thanks for the article Al. It brought back the extreme sense of relief I felt when I realized that this guy was helping me with the problem I had and he was get big. I may have to take him on walks with me after work to help him slim down. Dennis, thank you for sharing your experience here. Sounds like a great AND functional addition to your tank! Thanks for your great article. I can’t tell you that I’ve had mine for about 4 years and he is great but definitely is the culprit for the death of all my arthropods, except for my porcelain crab who guards his anemone. When they shed he’d eat them all. Thanks for sharing your experience with this fish and for calling out the behavior there towards the arthropods.